The origins of jigsaw puzzles go to the 1760s when the European map makers pasted maps onto wood and cut them into small pieces. 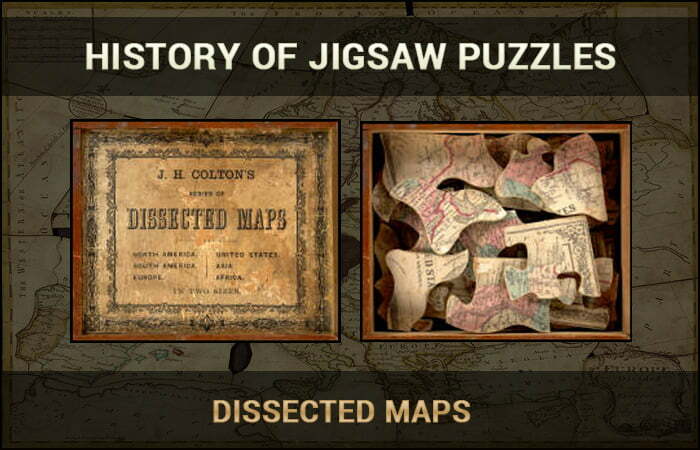 John Spilsbury, an engraver and mapmaker , is credited with inventing the first jigsaw puzzle in 1767. The dissected map has been a successful educational toy ever since. Australian children still learn geography by playing with jigsaw puzzle maps of Australia or the world. The eighteenth century inventors of jigsaw puzzles would be amazed to see the transformations of the last 250 years. Children’s jigsaw puzzles have moved from lessons to entertainment, showing diverse subjects like animal, nursery rhymes, and modern tales of super heroes. But the biggest surprise for the early jigsaw puzzle makers would be how adults have embraced jigsaw puzzling over the last century. Jigsaw puzzles for adults emerged around 1900, and by 1908 a full-blown craze was in progress in the United States. Contemporary writers depicted the inexorable progression of the jigsaw puzzle addict from the sceptic who first ridiculed jigsaw puzzles as silly and childish to the perplexed puzzler who ignored meals while chanting just one more piece to the bleary eyed victor who finally put in the last piece in the wee hours of the morning. The jigsaw puzzles of those days were quite a challenge. Most had pieces cut exactly on the colour lines. There were no transition pieces with two colours to signal for example, that the brown area (roof, for example) fits next to the blues (sky, for example). A sneeze or a carless move could undo an evenings work because the pieces did not interlock. Unlike children’s jigsaw puzzles, the adult jigsaw puzzles had no guide picture on the box. If the title was vague or misleading, the true subject could remain a mystery until the last pieces were fitted into place. Because wood jigsaw puzzles had to be cut one piece at a time, they were expensive. A 500 piece jigsaw puzzle typically cost $5 in 1908, far beyond the means of the average worker who earned only $50 per month. High Society however, braced the new amusement. Peak sales came on Saturday mornings when customers selected puzzles for their weekend house parties in Newport and other country retreats. The next few years brought two significant innovations. First, Parker Brothers, the famous game manufacturer, introduced figure pieces into it’s Pastime brand jigsaw puzzles. Figure pieces made puzzles a bit easier to assemble, but the fascination of pieces shaped like dogs, birds and other recognisable objects more than offset the somewhat reduced challenge. Second, Pastimes and other brands moved to an interlocking style that reduced the risk of spilling or losing pieces. Pastime jigsaw puzzles were so successful that Parker Bros stopped making games and devoted it’s entire factory to jigsaw puzzle production on 1909. Following this craze, jigsaw puzzles continued as a regular adult diversion for the next two decades. With the onset of the great depression in 1929, jigsaw puzzles for adults enjoyed a resurgence of popularity, peaking in early 1933 when sales reached an astounding 10 million per week. Jigsaw puzzles seemed to touch a chord, offering an escape from the troubled times, as well as an opportunity to succeed in a modest way. Completing a jigsaw gave the puzzler a sense of accomplishment that was hard to come by when the unemployment rate was climbing above 25 per cent. With incomes depleted, home amusements like jigsaw puzzles replaced outside entertainment like restaurants and nightclubs. Jigsaw puzzles became more affordable too. Many of the unemployed architects, carpenters and other skilled craftsmen began to cut jigsaw puzzles in home workshops and to sell or rent them locally. During the 1930’s craze for jigsaw puzzles and circulating libraries they added puzzle rentals to their offerings. They charged 3 to 10 cents per day, depending on the size. Another important development was the introduction of die-cut cardboard puzzles for adults. Mass production and inexpensive cardboard allowed the manufacturers to cut prices substantially. There was a vogue for advertising jigsaw puzzles in mid – 1932. Retail stores offered free jigsaw puzzles with the purchase of a toothbrush, a flashlight or hundreds of other products. What better way to keep a brand name before the public than to have customers working for hours to assemble a picture of a product? The autumn of 1932 brought a novel concept, the weekly jigsaw puzzle. The die cut Jig of the week retailed for 25 cents and appeared on the news stands every Wednesday. People rushed to buy them and to be the first amongst their friends to solve that week’s jigsaw puzzle. There were dozens of weekly series including Picture Puzzle Weekly, B-Witching Weekly, Jiggers Weekly and (featuring popular films) movie-cut ups. With the competition from the free advertising jigsaw puzzles and the inexpensive weekly jigsaw puzzles, the makers of hand cut wood jigsaw puzzles were hard pressed to keep their customers. Yet the top quality brands like Parker Pastimes retained a loyal following throughout the depression, despite their higher prices. The depression led to the birth of Par Puzzles, long dubbed the Rolls Royce of Jigsaw Puzzles. Frank Ware and John Henriques young men with no job prospects, cut their fist jigsaw puzzle at the dining room table in 1932. While other firms were cutting costs (and quality), Par steadily improved their jigsaw puzzles and marketed them to affluent movie stars, industrialists and even royalty. Par specialised in customised jigsaw puzzles, often cutting the owners name or birth date as figure pieces. Ware and Henriques also perfected the irregular edge to frustrate traditional jigsaw puzzlers who tried to start with the corners and edge pieces. They further teased their customers with misleading titles and Par times that were unattainable for all but the fastest jigsaw puzzlers. After World War 11, the wood jigsaw puzzle went into a decline. Rising wages pushed up costs substantially because wood puzzles took so much time to cut. As prices rose, sales dropped. At the same time improvements in lithography and die cutting made the cardboard jigsaw puzzles more attractive, especially when Springbok introduced high quality reproductions of fine art on jigsaws. In 1965, hundreds of thousands of Americans struggled to assemble Jackson Pollock’s convergence, billed by Springbok as the world’s most difficult jigsaw puzzle. One by one the surviving brands of wood jigsaw puzzles disappeared. Parker Bros discontinued its Pastime Jigsaw Puzzles in 1958. By 1974 both Frank Ware of Par and Straus (another long time manufacturer) had retired from the business. The English Victory jigsaw puzzles easily found in department stores in the 1950’s and 1960’s, almost completely vanished. As the true addicts of wood jigsaw puzzles began to suffer withdrawal symptoms, Steve Richardson and Dave Tibbetts saw an opportunity to fill the void. They founded Stave Puzzles, and within a few years had succeeded Par as the leader in wood jigsaw puzzles. Indeed, Stave went several steps beyond Par, by commissioning original artwork that was specially designed to interact with the cutting patterns. Experimentation with pop up figure pieces led to three-dimensional puzzles such as free-standing carousel. Over the years Richardson invented many trick jigsaw puzzles that fit together in several different wrong ways, but with only one correct solution. Stave empathises personalised jigsaw puzzles and service, even remembering its customer’s birthdays. Stave’s success with luxury jigsaw puzzles convinced others that a market could be found, leading to a broader resurgence of hand-cut and custom jigsaw puzzles. The last decades has brought many design innovations as new craftspeople have turned to jigsaw puzzles. There are even some wood puzzles but by computer controlled water jets or lasers. Jigsaw puzzle aficionados of today can choose from a number of different styles of wood jigsaw puzzles to suit their passions for perplexity. Quite a few are graduating from cardboard to wood jigsaw puzzles as they discover the satisfying heft of the wood pieces, the challenge of matching their wits against an individual jigsaw puzzle cutter, and the thrill of watching a picture emerge from a plain box with no guide picture on the lid.